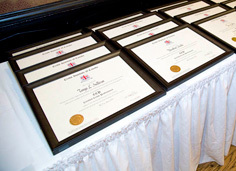 The Certified Credit Professional designation from the Credit Institute of Canada is a recognized symbol of excellence and integrity in credit management. You may have noticed that senior management, managers and your peers working in the credit sector use the CCP designation after their name on business cards, professional profile pages and in their email signatures. This is a symbol of their dedication to continuous learning and excellence in the credit field. The CCP program bridges the knowledge gap between a college or university education and the workplace. Emphasis is on the practical application of what students learn. You too can join these credit experts by getting certified. The CCP designation can be obtained after completing flexible online courses and demonstrating a minimum of 5 years of experience working in the credit sector. If you already have extensive experience in the credit sector and you would like your expertise to be formally recognized, the Challenge Exam may be the route for you. The Challenge Exams allows you to take an equivalency test to obtain the CCP designation.